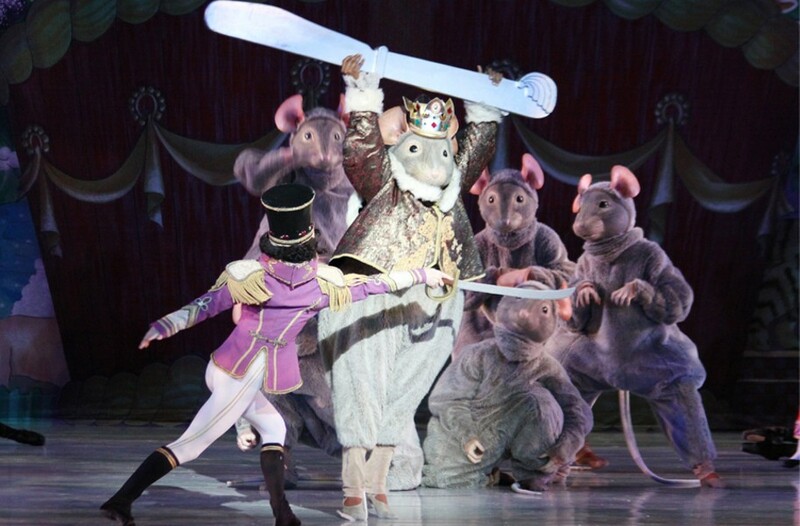 The Rat King discusses what it’s like being the regal rodent in Richmond Ballet’s “The Nutcracker” | Arts and Culture | Style Weekly - Richmond, VA local news, arts, and events. Tis the season for choreographed party waltzes, dancing dolls, twinkling snowflake flurries, a soaring swan, and sparkling sweets. That's right, it's "Nutcracker" time, and the Richmond Ballet will present the festive fable in all its glittering grandeur for the 35th year in a row. Audiences young and old will leave the theaters humming the overture and twirling to refrains of the Sugar Plum Fairy, but let us also give credit to the character that adds suspense and sizzle to the story: the Rat King. It would be difficult to imagine "The Nutcracker" without its signature stinker and rodent rapscallion. And while Rat King typically stands among ballet's most vile villains, Richmond Ballet's mischief-maker is less a scoundrel than a ham. Style Weekly caught up with the regal rodent to marvel at the mouse behind the myth, the big cheese himself. When asked how he first became interested in "The Nutcracker," the Rat King recounted how a last-minute invitation to a holiday cocktail party precipitated a fortuitous introduction to the Richmond Ballet's pioneering artistic director, Stoner Winslett. "It was kismet. We locked eyes across the room and I knew I had a friend when she offered me brie instead of chasing me out the door with a broom," he says. "I didn't even need to audition. Apparently, I was a perfect fit!" Though his ascent to "Nutcracker" nobility was fast and furious, King has a calm, collected, and thoughtful approach to his practice. He adheres to a rigorous diet to maintain his perfectly portly aesthetic, he says, eating "only cheese for breakfast, lunch and dinner." During the grueling performance schedule, King commits to health and wellness. "I'm a big believer in self-care. After shows I like to come home and take a nice, hot bath to melt away the stresses of battle," he says. When asked if he has any preshow rituals, his toothy smile beams and he excitedly talks about getting revved up with "my boys, my besties, my posse." To King, his fellow rats aren't the minions of his mayhem, they are trusted confidantes and cherished friends with whom he delights in causing chaos. Rat No. 5, or El Cinqo, as he is commonly called, gushed that "King is the true leader of our rat pack and we would follow him anywhere." King's Rat No. 1 confirmed the group's love for the monarch adding simply, "he's the best." And King shoulders the responsibility for his posse well, teaching them valuable skills like sharpening the flatware between their teeth before battle, and holding their tails backstage so an errant piece of scenery or a ballerina's pointe shoe doesn't put a kink in the armor. "I learned that one the hard way," says the King as he tenderly strokes a furless spot towards the base of his tail. Surprisingly, the mouse remained mum when it came to the topic of love. He neither confirmed nor outright denied a rumored relationship with the Sugar Plum Fairy, mentioning only that she is "a very delicate diva with a most unfortunate distaste for fondue." Acknowledging the need for a quick change of topic, we discussed the trajectory of the story and whether King ever longed to rewrite the script, reigning victorious in the battle. "I enjoy my part in the story immensely and see myself really as the catalyst for all the beauty and magic that unfolds after my demise," he explains. "My presence is the obstacle the Nutcracker must overcome before he becomes who he is meant to be. Only in my defeat can the Nutcracker become a true hero, a true prince." As seems fitting for the charmer, King adds with a sly grin: "Plus, the land of Sweets isn't my ideal vacation spot. Perhaps when Clara and the Prince sail to the Cave of Cheese I'll change my tune." Stoner Winslett's "The Nutcracker" with the Richmond Symphony runs at Dominion Energy Center from Dec. 14 through 23 at various times with evening and matinee shows. Tickets cost $25 to $125. richmondballet.com.